Darth Vader #10 wraps up the Jocasta Nu arc as Vader captures her and…deals with her. As expected, the item she was after was a list of Force sensitive children. Unexpectedly, Jocasta Nu proved to be a very talkative person. Perhaps too much for her own good, or perhaps according to her plan. The issue opens in the Jedi Temple with Vader and Jacasta still squaring off. With her Jedi super rifle powered by her own lightsaber, she fails to do any damage to the dark lord of the Sith. She does manage to destroy vast chunks of her precious library and to melt her own lightsaber. Vader promises not to hurt her, but she decides not to surrender. She jumps out of the temple and is attacked by clone troopers. Cornered again, she tries to kill herself by jumping off the ledge into one of Coruscant’s chasms. Vader, however, grabs her with the Force and takes her prisoner. What he doesn’t expect is for her to start gabbing. She goes on about Palpatine corrupting him, wanting to use that list of Force sensitives, and possibly replacing Vader. She also blabs to everyone in ear shot that Darth Vader is Anakin Skywalker. Without any other choice, Vader has to kill everyone. That includes Jacasta. He also destroys the list just in case Palpatine really was planning to replace him. He reports in to Palpatine, lies through his teeth, and the job is done. However, the issue lays one final story seed and that’s the auxiliary library that Jocasta created on some other world. Years later, the comic shows Luke discovering the library. Keep in mind this is theoretically canon, so it’s also confirmation of where Luke learns a lot about the Jedi history. I actually really liked this issue. 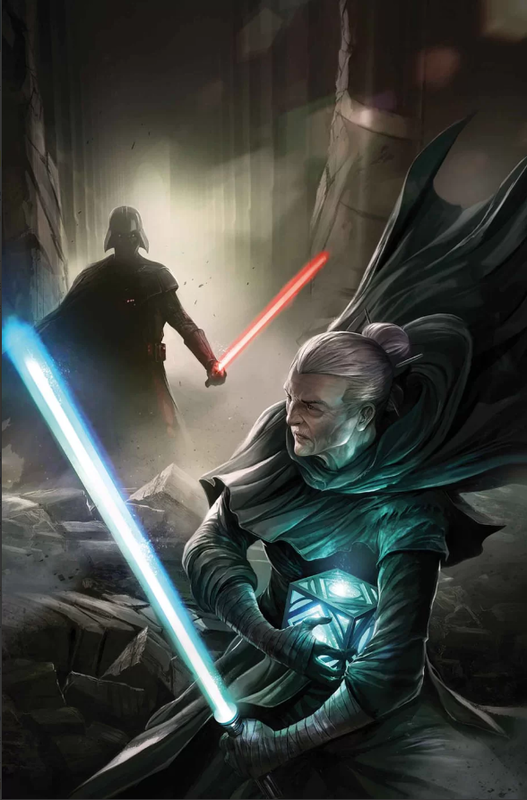 Soule was careful not to make Vader look weak, and he very much dominated the fight with Jocasta Nu. While she tried to manipulate him, and did to an extent, Vader still came out the winner. In a way, her manipulation was actually something that helped Vader, it just happened to be something that hurt Palpatine. On top of all that, I liked how it tied to Luke in the end. That, and it was kind of morbidly funny seeing the clone troopers turn on Vader, and then later on, Vader having to take some of them out. The artwork throughout was pretty good. Vader is very stylistic, but everything else is true to form. It does a good job of showing the action and the emotion of the characters. For a comic, that’s the essential ingredients. There weren’t any awful panels that threw me out of story, and just about everything was visually pleasing. It worked well. With good artwork and a good story, I give Darth Vader #10 a five out of five metal bikinis. While the arc leading up to this issue may have stumbled a little and wasted some time with the Inquisitor, overall it paid off well.